The New Zealand Brain Bee Challenge encourages high school students to take an interest in the human brain and neuroscience and to continue with this subject into their university studies. 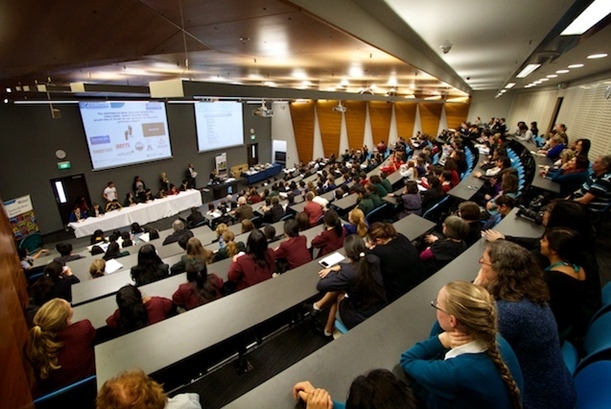 With our close connection with the study of brain disease through the University of Auckland’s Centre for Brain Research, the Foundation lends a helping hand, as one of many supporters, to this annual competition involving around 45 secondary schools and 1500 students. Our individual winners now travel to Sydney for an Australasian competition later this year. Representatives from both countries then proceed to a world final where the ‘top brains’ from 30 countries meet. The Brain Bee competition was founded in the US in 1999 and has been conducted here annually since 2007 to help inspire New Zealand students to pursue neuroscience careers in order to help treat and find cures for neurological and psychological disorders. Year 11 students compete to determine who is the ‘best brain’ on such topics as intelligence, memory, emotions, sensations, movement, stress, aging, sleep, addiction, Alzheimer’s and stroke. The 2014 New Zealand winner was Nicholas Kondal, from Massey High School, Auckland who is yet to travel to his international event to be held in Cairns, Australia. 2013 winner was Thomas Chang from Auckland Grammar School who went to Washington DC (with his Dad) and achieved an outstanding third place – that’s in the world!